EK-Cable Y-Splitter 3-Fan PWM is a simple adapter used to hook three DC or PWM fans to one motherboard 4-pin PWM or 3-pin DC FAN connector. Please note RPM sensing will only work for one fan when using this cable. 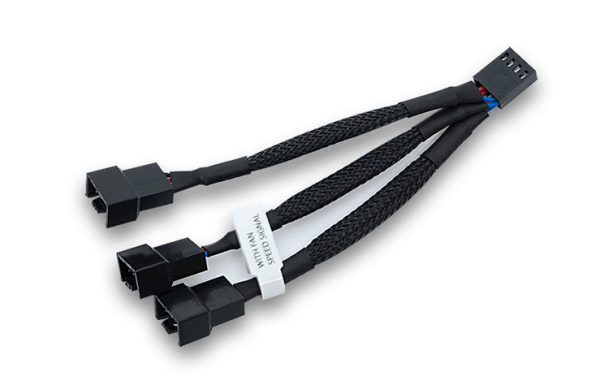 – Compatible with 3-pin DC fans and fan connectors. Made in China for EKWB! Do not use high power fans with this adapter due to the possibility of overloading motherboard fan power regulator. The limit of a fan header on a typical motherboard is usually around 1A (12W). Please note RPM sensing will only work for one fan when using this cable.